Today is the 210th anniversary of the naming of Port Lincoln, on the Eyre Peninsula in South Australia, on the shores of Boston Bay, which opens out into the Spencer Gulf. Port Lincoln is a regional city of around 15 000 people, and about 7% of the population are Indigenous, from the Nauo, Barngala, Wirangu, and Mirning peoples. Two of Port Lincoln’s claims to fame are that it is said to have more millionaires per capita than any other place in Australia, and boasts the title of Seafood Capital of Australia, as it has the largest commercial fishing fleet in the country, which catch tuna and sardines, and a thriving aquaculture industry which farms tuna, yellowtail kingfish, abalone, mussels, oysters, seahorses, and lobsters. Port Lincoln has produced more than its fair share of athletes and sportspeople, with many AFL footballers originally hailing from Port Lincoln. Netballer Lauren Nourse began her career in Port Lincoln, and Paralympic cyclist Kieran Modra was born there. Weightlifter Dean Lukin, who won gold at the 1984 Olympics, was a tuna fisherman, and upon his retirement returned to manage the family fishing business. Another with a connection to the fish industry is tuna farmer Tony Santic, the owner of Makybe Diva, the only horse to win the Melbourne Cup three times. There is a life-sized bronze statue of Makybe Diva on the town’s foreshore. 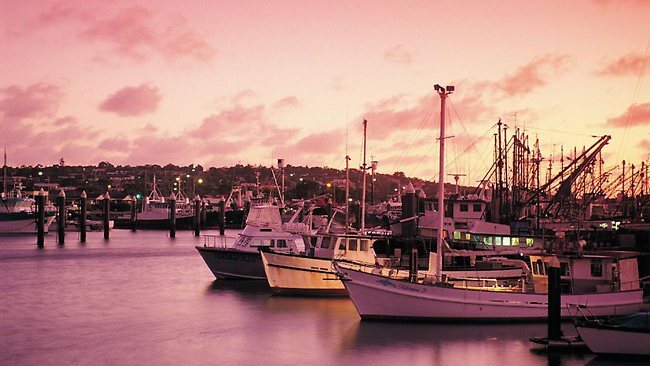 The scenic beauty of Port Lincoln attracts many tourists, who come here for yachting, scuba diving, and game fishing. The novel Blue Fin by Colin Thiele is set in Port Lincoln and revolves around the fishing industry; the movie was filmed in nearby Streaky Bay. Some of the scenes from Jaws and Gallipoli were filmed in Port Lincoln, and the reality television show Australian Survivor was filmed nearby. British naval explorer Matthew Flinders discovered Boston Bay on February 26 1802, and named the body of water Port Lincoln, after his birthplace of Lincoln in England. Lincoln is believed to mean “settlement by the pool” in a blend of the British and Latin languages, with “the pool” referring to Brayford Pool, a natural lake in the city’s centre. The city of Lincoln is twinned with Port Lincoln in South Australia. The surname Lincoln comes from the city of Lincoln, and the most famous bearer must surely be Abraham Lincoln, the 16th President of the United States. He led his nation through the American Civil War, and his Gettysburg Address became an iconic statement of American belief in the principles of liberty and democracy. His assassination in the final weeks of the Civil War made him a national martyr, and he is consistently ranked as one of the greatest US Presidents – often, the very greatest. Lincoln has been used as a first name for boys since the 18th century, with most early bearers of the name born in Lincolnshire and surrounding districts. Although Lincoln was used as a name in the United States before Abraham Lincoln, its use soared during the years of the Civil War and just after it, and must often have been given in honour of the president. A famous Australian with this name is actor Lincoln Lewis, the son of rugby league legend Wally Lewis. He has appeared in several television series, such as Home and Away and Neighbours, and had roles in films such as Tomorrow, When the War Began and After Earth. Lincoln is the brother of sportcaster Mitch Lewis, a celebrity dad on the blog in 2012. The name Lincoln first charted in Australia in the 1960s, and first ranked in the 1970s, débuting at #207. It remained comfortably in the 200s for decades, then suddenly climbed at a dizzying speed during the latter half of the 2000s, and was in the Top 100 by 2009. The instigator of this surge of popularity was probably US television drama series Prison Break, starring Dominic Purcell as Lincoln Burrows. Dominic moved to Sydney from Britain as a baby, and studied acting at the Western Australian Academy of Performing Arts. He won an Australian Film Institute Award for his role in Prison Break. Currently Lincoln is #67 nationally, #76 in New South Wales, #66 in Victoria, #40 in Queensland, #38 in Western Australia, #37 in Tasmania, and #66 in the Australian Capital Territory. Lincoln was one of the fastest-rising boys names of 2012 – the same year that the movies Lincoln, and Abraham Lincoln, Vampire Hunter were released. From the data that’s come in so far, Lincoln looks set to continue his ascent as one of the fastest-rising names of 2013. Lincoln is a handsome, clean-sounding modern classic that may be more Aussie than you expected. It has certainly been warmly embraced in Australia, and is more popular here than in either the US or UK, where it isn’t even in the Top 100 (its similarity in sound to popular Lachlan can’t have hurt). Lincoln’s star is on the rise, and looks set to join the national Top 50 fairly soon: it’s already in my personal Top 50 for 2013. Linc is the obvious nickname, with an attractive similarity to the word link, suggesting your little Linc could join the family together. I am spotting the short form more and more often in birth notices – perhaps because some parents are becoming reluctant to choose the popular Lincoln. Lincoln received a respectable approval rating of 64%. People saw the name Lincoln as stylish and cool (16%), handsome and distinguished (15%), and strong and masculine (15%). However, 14% thought it was too trendy. Only one person thought the name Lincoln was too popular. I’m planning to do a list of names from Australian Prime Ministers and their wives/partners … something always seems to beat it to the punch!